Popped in for a swift Beck's Blue on my way home last night. Is there a by-law that states that all pubs in Kilburn High Rd must charge £3.80 for said item, for which gideon osbourne takes very little due to its meagre alcohol content? this pub has pretensions to be better than it is. I have used this pub on a number of occasions and each time the food has got steadily worse untill two nights ago i was served a meal that was raw in the middle and cold.this was sent back to the kitchens and the management informed.the whole pubs attitude is one of DONT CARE. if your going for a pint its ok, if your going for food DONT.! 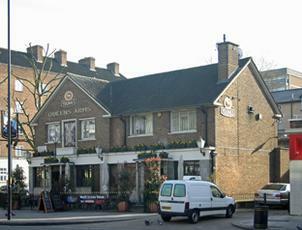 Large pub on the main road but away from the centre of Kilburn. Doesn't seem sure what it wants to be - there's a large restaurant area at the back, there were several families in there with kids but also a couple of (silenced) TVs showing football. Pleasant staff, standard selection of Youngs ales on. Better than some of Kilburn's other pubs but that doesn't take much doing. One time, in the not too distant past, this was an old school bar/lounge Young's pub serving the best pint of proper beer in Kilburn. Now it's some kind of dark hole - not a pub, nor a restaurant but some kind of dismal mish mash bar with a few sofas and high chairs. I tried a pint of Young's Special which was diabolical. Even the lager was garbage. Three room pub (public bar, saloon bar, dining/function area) with Sky Sports (not sure about ESPN), occasional music. A good pint of Young's bitter (I think Special and Bombadier are also available). Menu is British pub food plus some European dishes and well priced and the fish & chips were fine.